This magazine informs you about the highlights in real estate business in the Middle East, reports about the most important and upcoming projects and the high-quality lifestyle in the Middle East. Middle East Real Estate creates exactly those superior contacts in Germany which you normally can achieve in personal meetings. Middle East Real Estate will be distributed to the top policy-makers and entrepreneurs in Germany. 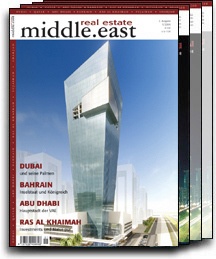 Middle East Real Estate is the insider magazine in the middle east real estate business. Middle East Real Estata tells about the backgrounds, companies and projectstories and furthermore it gives you visions for the future in these areas. Middle East Real Estate arouses interest to the readers to buy properties, to live there or to have a summer residence there. All these features we can give to the advertisers, cause the publishing house is very reputed in Germany and has an excellent distribution database.